The influx of foreign tech workers to the Eastside is causing a surge of Asian student enrollment in Bellevue schools, and leading the schools to find new ways of bridging cultural differences about academics and student life. When Karthik Durghados accepted a job with Amazon in Seattle late last year, his wife, Devi, started researching schools for their son. She zeroed in on the Bellevue School District, with its high test scores and nationally ranked high schools. Because their son would transfer from his school in Chennai, India, to second grade here, she also looked up individual elementary schools in the district and their racial and ethnic diversity. Since October, 32 new families have enrolled at Clyde Hill Elementary School, many steered there by foreign-language websites and the testimonials of friends and high-tech colleagues who have come before. “I’ve had parents show me on their phones Korean and Chinese websites. ‘Here you are! It says ‘come here,’ ” said Clyde Hill’s principal, Mary Olin. Unlike immigrants who arrive with little formal education, these parents are typically highly educated, often bilingual, and, school officials say, have high expectations for their children’s academic achievement. For the past two years, Olin has welcomed these families with bimonthly coffees, parent cultural ambassadors who speak five different languages, and teachers newly trained to engage students who have never spoken English before. Olin, who was previously principal of the American School in Shanghai, said she sees her role as cultural guide, answering families’ practical questions, such as where to find a doctor but also interpreting an American education system where a positive report card may say “meets standards” and where parents are welcomed inside the school. Asian students — both foreign and American born — now make up about one-third of the district’s enrollment and more than 70 percent of those in its gifted programs. Bellevue started tracking students’ country of origin only this year, but U.S. census data for the city of Bellevue show a sharp increase in Chinese and Asian Indian families since 2000. And district records of students’ first languages show the number of Mandarin, Cantonese and Taiwanese speakers has jumped 91 percent over the past decade, to about 1,600, while the number who speak an Indian language has grown more than fourfold, from 185 in 2004 to more than 800 today. 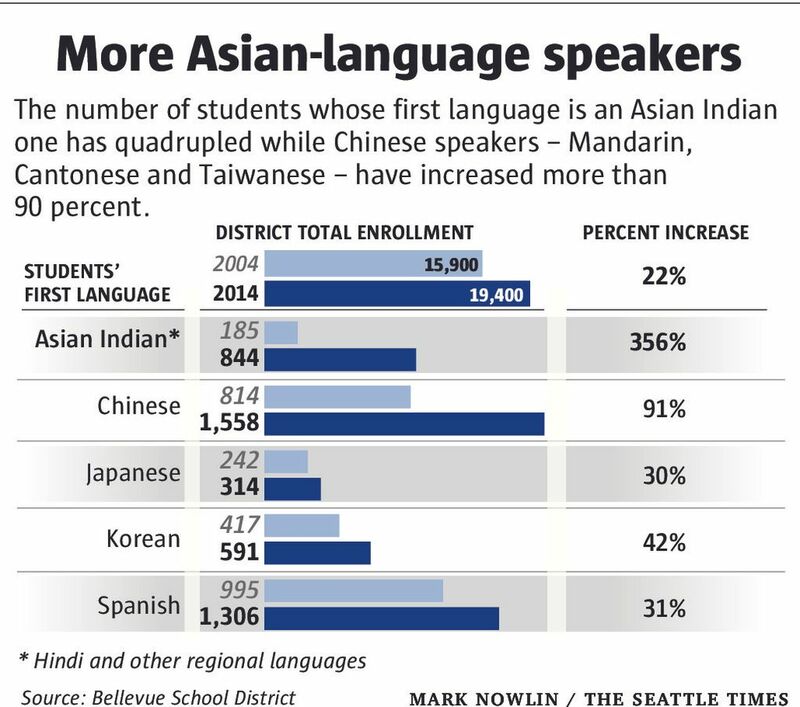 That’s still a small fraction of the district’s total enrollment of about 19,100, but the influx of new Asian immigrants is changing the scene — and the parents’ questions — at many of Bellevue’s schools. At a recent welcome coffee, 20 new families met with Olin as well as the schools’ PTA co-presidents and several of the cultural ambassadors. The PTA leaders, Paleia Cartier and Radha Joshi, show the school’s diversity in action. Cartier and her husband both grew up in Clyde Hill and attended the school. “When I was a kid, there was not diversity at all,” she said. Joshi grew up in Utah, the daughter of Indian immigrants and the only non-Caucasian in her schools. She moved to Bellevue a year ago and said she was surprised by the number of East Indians and other international families. Joshi noted that if a child from China doesn’t speak English, the school will try to put him or her with a buddy who also speaks Chinese. “People here embrace you. A lot of the new families are pleasantly surprised to find out they are welcomed here,” she said. The two tell parents about school activities and opportunities to participate. Volunteering is often another foreign concept, they say. Some parents tell them they were dropped off at school at 8 a.m. and didn’t see their parents again until 5. The notion that the school might want their help is a surprise. The PTA leaders also introduce the idea of making financial donations to support the school. Last year, they say, the $250,000 raised paid for five additional instructional assistants to help teachers in the classroom. Parents have told them that in their countries, giving money to a public official would be considered a bribe. And while these parents may pay for their own child’s education and extra activities, they aren’t familiar with making a donation to help all students. Two Polish parents, Krystian and Magdalena Walec, say that at his previous posting in the United Kingdom, there was no welcome coffee if a student arrived at the start of the school year. The couple say they’re pleased by their experience so far at Clyde Hill. “The school is very open. They let us know what’s going on,” Krystian said. That same morning, on the opposite side of Bellevue, another coffee was held for about a dozen Japanese moms new to the district. Leading the session were two older mothers who emigrated from Japan a generation before and experienced the cultural isolation of being some of the few international parents at their children’s schools. They explained to the new mothers some American elementary-school customs, like exchanging valentines, and answered more serious questions about math instruction (Does the American way prefer the process to the correct answers and speed of calculations?) and about bullying (Do racial bullies exist in Bellevue schools?). Yes to both, said Haruka Kojima, in Japanese, translating later for a visitor. She told the mothers that when she reported an incident of bullying to a dean of students, it was acted upon quickly. And she said the district is currently undertaking an equity initiative meant to improve cultural understanding and respect. But yes, she said, it does sometimes happen. Kojima and her friend Linda Mui started the multi-language principal coffees at Chinook Middle School, then Bellevue High School, then Clyde Hill. 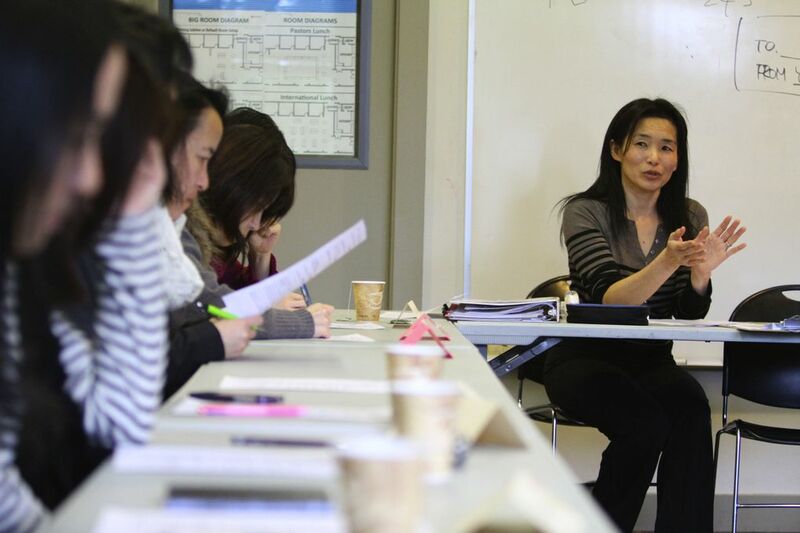 She now helps lead twice-monthly districtwide meetings for Japanese parents. Kojima said Asian families are more familiar with competition for good grades and class ranking. They wonder why the schools here require community service for graduation and encourage involvement in sports and school clubs. “Here, there’s more interest in the whole personality — community service, leadership, volunteerism. It’s a whole different concept,” she said. She also worries that Asians’ growing numbers and their success in the school district — such as high enrollment in the gifted program — could lead to a backlash. 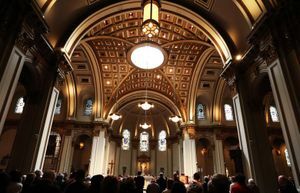 “People here may resent us, feel invaded,” she said. But she also observed that the value many Asians place in education and hard work may also raise achievement throughout the district. “The standards of education may be rising,” she said. Sally Schroedl, a second-grade teacher at Clyde Hill, keeps an energetic class attentive with interesting math problems and the possibility that any student could be called upon next. During fall she completed an intensive district training program to help engage and support English-language learners. She encourages the students to confer in teams. The international students hear English speakers explain their answers, giving them confidence that they can do the same. Schroedl said she includes her students’ names in the math problems: Raika and Olivia, Jing Chen and Yian, Daeyon and Ella Detroit. Two, Jing Chen and Yian, she said, spoke no English at the beginning of the school year. Now they each take a turn standing in front of the classroom with a microphone and whiteboard. After the morning coffee for new families, parents talk with other Chinese or Indian parents, expressing surprise that they should meet at this school, halfway around the world. Karthik Durghados said his son Thejas is making friends, and not only with other Indian children. 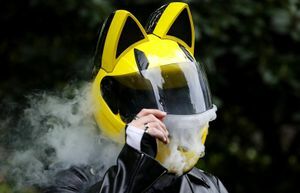 “His buddy’s name is Jack,” Durghados said. He explained how Jack gave Thejas Seahawk tattoos to wear for the Super Bowl. His parents bought him a Russell Wilson jersey. They watched the game with neighbors at a city community center. Thejas was inconsolable after the loss.